My approach to executive coaching is based upon performance improvement as an individual and as a leader. This differs from other coaching methods because it integrates positive behavior change into successful leadership practices. Executive coaching is a process of enabling individuals to live and to lead more purposefully. My approach to executive coaching builds upon an individual’s personal goals as well as a desire for improvement and impetus to succeed within the organization. Executive coaching leverages a purposeful commitment to growth with the need to fulfill the organizational mission. Performance-based coaching builds upon positive behavior change that enables the fulfillment of both personal and professional goals. 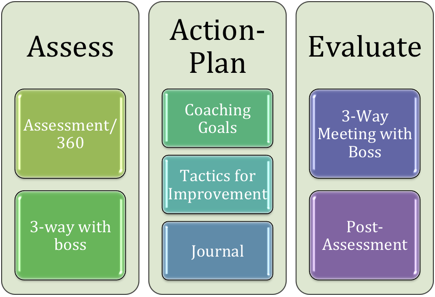 My leadership coaching practice uses three key principles: assessment, action planning, and evaluation. Executives do not work in a vacuum and neither should coaching. While executive coaching is focused on individual change such change occurs within an organizational framework. For this reason coaching can focus on the business issues facing the executive and his/her team. Advisory service coaching focuses on helping executives address topics related to managing a team and leading an organization. 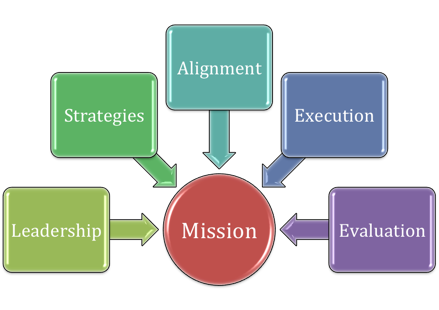 Mission: How do I set expectations for achieving our mission? Leadership: Who is on our team and why? Strategies: How can I prioritize our tactics to meet our objectives? Alignment: How do I create alignment between our people and our strategies? Execution: How can we optimize performance? Evaluation: Did we achieve our intended results?